War and economic issues have taken their toll on the whisky market in Ukraine, with many people no longer able to afford their favourite brand of Scotch. And yet the interest in malts and blends remains undimmed, as Erkin Tuzmukhamedov reports. If you’re male, aged 16-60, have a Russian passport and want to travel to anywhere in Ukraine, you have to undergo an interview with a security officer. Given the recent tensions between Russia and its nearest ethnic sister, it’s understood. But it’s also horrifying and can’t be explained on a rational level, when you bear in mind that modern Russia evolved from Kievskaya Rouss, and that Kiev, the capital of Ukraine, is considered as the ‘mother of all Russian cities’. I’ve done those interviews five or six times over the past couple of years, in Odessa and Kiev. You have to answer lots of questions about when and how many times you’ve been to Ukraine: well, I spent many happy childhood summers on Ukraine’s Black Sea beaches, and I served in the army in Kharkov. What really kills the interrogators, though, is that my wife's mother was born in Lviv, western Ukraine. And then comes the question: ‘The reason for your visit?’ The answer – ‘whisky’ – puts security officers into a kind of stupor. The past few years have not been kind to the market for whisky in Ukraine. As local currency the hrivna has collapsed, imports have become much more expensive, meaning local people have either stopped drinking Scotch altogether or traded down to less expensive products. And yet, underneath this apparently gloomy picture, the interest in Scotch whisky remains undimmed. Mortlach 1996 Odesskoye Chernoye Cask Finish, bottled by Ukrainian independent bottler Scyfion Choice, was named as the best single cask bottling aged 16-21 years in the most recent edition of Jim Murray’s Whisky Bible. It is one of a series of recent Scyfion Choice releases, masterminded by Ruslan Zamoskovny, one of the most respected authorities on whisky in Ukraine. A major difficulty has been to ship the barrel with some residual wine to the UK, fill it with single malt, double-age it, bottle it, and then ship it back again to Ukraine. But now Scyfion is working on single malts finished in other CIS wine casks, sourced from Georgia, Armenia and Azerbaijan. Zamoskovny earned recognition about 15 years ago when he was chef sommelier of Corvin Club, a pub in Odessa, and created a whisky collection and a whisky room within the pub. For many years Corvin was recognised as the best whisky venue in the former USSR. Odessa, as the main port on the Black Sea, was always, since the times of Catherine the Great of Russia, who conquered these territories and named them Novorussia (New Russia) in the late 18th century, a major centre of contraband. Today, in shops on the central city boulevards (no addresses – ask the locals), you can buy ‘duty free’ (ie contraband) whiskies, other booze, cigarettes and perfume. No wonder Corvin had the best choice of whiskies, lots of them without excise stamps. But Zamoskovny was not the first Ukrainian Scotch malt whisky bottler. Alexei Savchenko Sr, founder of the All Ukrainian Whisky Connoisseurs Club, made the first private Ukrainian club bottling in 2009: a Bruichladdich Super Heavily Peated, selected by him under the supervision of Jim McEwan, then distiller of Bruichladdich. It is the most heavily peated Laddie ever distilled there. The club has made seven bottlings – most of them from BenRiach, and one from Fettercairn. The bottlings are sold exclusively in the Whisky Corner restaurant in Sofiiskaya Street, Kiev, the headquarters of the Ukrainian Whisky Connoisseurs Club. Alexei Savchenko Sr died in 2010 with a dream to build a headquarters for the society; now the club is named after him, thanks to his son, Alexei Savchenko Jr, current chairman of the society, who opened Whisky Corner in 2012. Now rated one of the top five restaurants in Kiev, Whisky Corner (apart from the nice cuisine – haggis is a local hit) boasts the best collection of whiskies in Eastern Europe – at least 750 different whisky bottles available at any time. The display is respectfully called The Cathedral. The house whisky is Glen Grant (US$8 a dram), and you can order any themed tasting suited to your wallet, with sommelier Oleg Kozlovsky or any of the three bartenders happy to guide you. From time to time, I get an invitation to attend special members' meetings, such as a pre-Christmas tasting last December which included three Port Ellens: Douglas Laing Port Ellen 25 Years Old (46%), Gordon & MacPhail Port Ellen 1979/2013 Rare Old (46%), and Port Ellen 9th Release 30 Years Old (57.7%). There were also some other nice Islays: Lagavulin 1990 Distiller’s Edition (43%), Ardbeg 21 Years Old (46%), Bruichladdich Super Heavily Peated (46%), Bruichladdich Islay Barley 2007 (50%). Tickets were a bit pricey (US$600), but then the whiskies were unique. Then, in January this year, they had another fine tasting of seven different Manager's Drams: Royal Lochnagar 10, Inchgower 13, Linkwood 12, Mannochmore 18, Dailuaine 17, Cragganmore 17 and Oban 200th anniversary edition, a 16-year-old. Whisky Corner has monthly club members' tastings, and open tastings of more ordinary contemporary bottlings of Scottish and world whiskies, like Taiwan's Kavalan, India's Amrut or Ireland's Teeling. Apart from Whisky Corner and Corvin, Ukraine has some whisky-led pubs, bars and restaurants with a good selection – Whisky Pub 4 Friends in Lviv; Double Whisky in Poltava; Whisky Shop in Kharkov. 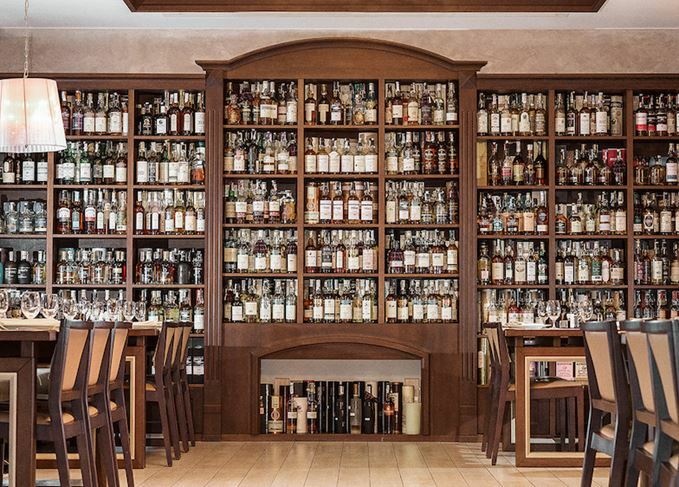 Every major city has a restaurant or a bar that calls itself ‘specialised in whisky’ – but normally they don’t have more than 30-50 whiskies, usually the most popular brands. Then there is Whisky Dram, a Kiev whisky festival organised by Wine Bureau, subsidiary of major importer/retailer Good Wine. The second Whisky Dram, in October 2016, was a big success, with more than 2,000 visitors, 333 different bottles, representing 60 brands from six countries. More than 7,000 drams were drunk, as well as over 1,000 whisky cocktails. What is more, the organisers prohibited blended Scotch whisky. Bourbons and Irish whiskeys were welcome, but no Scottish blends – only single malts. This second Whisky Dram was twice the size of the first one. I was impressed: many brands were represented not by the local importers' personnel, but by company representatives from Scotland and Ireland. Organisers encouraged visitors to vote for the best whisky of the festival – and it went to a Ukrainian Whisky Connoisseurs Club bottling, a 35-year-old Fettercairn, bottled at cask strength, 53.5%. The best Fettercairn I’ve ever tasted. The mood was festive, spirits were high (virtually no super-drunks) and there were lots of people wearing вышиванка (vyshivanka), а national embroidered shirt paired with a kilt – a strange combination, but one that embodies Ukraine’s ongoing love affair with Scotch whisky. Local currency, the hrivna, collapsed threefold in 2013, making imports of all kinds – including whisky – much more expensive for local people. The result is that people are cutting back and focusing much more on cheaper products. In 2013, Ukraine (population about 45m people) imported nearly 650,000 nine-litre cases of whisky, of which almost 500,000 cases were Scotch. In 2015, that had dropped to 520,000 cases (365,000 cases of Scotch); in 2016, it was just under 490,000 cases (340,000 cases of Scotch). For single malts, the peak came in 2012 with imports of just over 15,000 cases; this figure had almost halved to 8,000 cases in 2016. The Dutch show drew crowds of more than 800 whisky enthusiasts during its debut in Rotterdam.